Juicing is something that I was introduced to about ten years ago, and ever since, has remained a fundamental part of my healing regime. So….what’s so good about Juicing? Juicing is a fabulous way of sneaking the goodness of fruit and vegetables into your diet. Fruit and vegetables are full of antioxidants, vitamins and minerals. All the things I’ve just listed are essential for a healthy body and strong immune system. Not to mention a key part of the energy production process in our bodies. If you can make your juices as green as possible (so think, plenty of spinach/watercress) there will be the added benefit of an abundance of chlorophyll. Chlorophyll promotes cleansing, encourages healing and is a potent antioxidant known to be an anti cancer agent. As good as our intentions may be, sometimes our every day diet just doesn’t give us all the vitamins and minerals we need. A busy schedule may mean you only have time to grab a sandwich at lunch or in the cases of many of you reading this, you may be healing and not have the energy to eat or prepare a big meal. 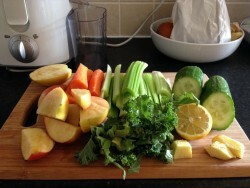 “Having a fresh juice each day is a fabulous way to get that concentrated dose of pure energy. Many of us are encouraged to supplement our diet with nutritional supplements. Although these have their place (and I myself take a selected few such as omega oils and vitamin C), more often than not, these little tablets are not easy for the body to digest. A well known nutritionist once told me ‘we are what we absorb’ and its so true. If we are spending a fortune on numerous supplements, but not actually absorbing them, what is the point?! Fresh juices are extremely easy for the body to absorb. 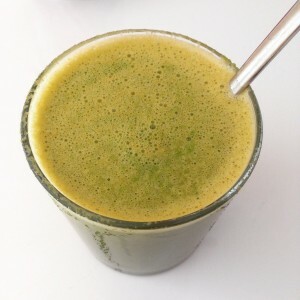 The digestive system doesn’t have to break down any bulkiness, so therefore, the body can just easily absorb the wonderful nutritional benefits from the juice itself. This is obviously fantastic for those of us with ME or any sort of long term illness, as often in these situations, our digestive systems aren’t working quite as they should. Where do I start? And how do I make them?! First of all….you will need to buy yourself a juicer if you don’t already have one. No need to spend a lot of money on it (unless you want to of course) but I will suggest avoiding the absolute cheapest one. Mid range is perfect. My current juicer was in the sale reduced from £100 to £50. Obviously if your budget will only allow for one that is about £20 – go for it, it will still work, there may just be a bit more wastage from your ingredients. Sometimes I experiment with different juices, and vary them depending what is in my fridge at the time. But often, to keep things simple, (and also to encourage me to do it daily) I have this basic recipe that I love. I make the habit of buying these ingredients as standard each time I get some shopping, that way, they are always on hand for my morning juices. So…here is the recipe for my…. Often (like really often, especially if I am having a particularly bad ME day) I can NOT be bothered to juice. My mind, and body, try their hardest to convince me not to do it. Saying things like ‘ah its too much effort’ ‘I can’t be doing with washing the juicer after’ ‘I feel too ill’ (you get the picture) but I NEVER regret juicing. I’m always so pleased I’ve done it. It feels like a lovely little gift to the insides of my body and my energy system. Just bear this in mind for when you feel its too much of a faff. How many of us waste ten minutes each day scrolling through facebook? If we can do that, we can take ten minutes to juice.